Although Wizkid has been dragged on social media for being a cruel and uncaring person countless times, few people still stand up for him and say he is a good person. 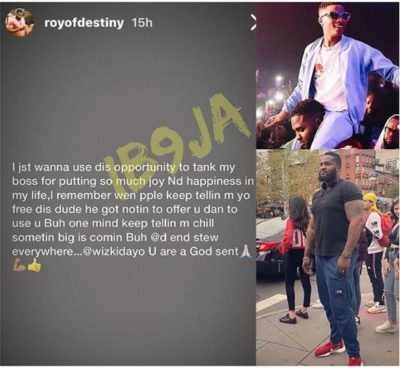 Wizkid body guard Royofdestiny took to his Instagram page thanking Wizkid for being a helper in his time of need. 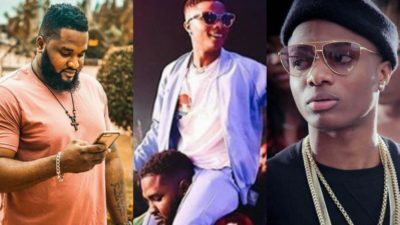 He also recalled when people around him would tell him to leave the Wizkid camp as they believed Wizkid was only going to use him, but he didn’t listen cos a part of him still love working for Starboy and now he his benefiting from working with Wizkid as there are plenty stew for him.